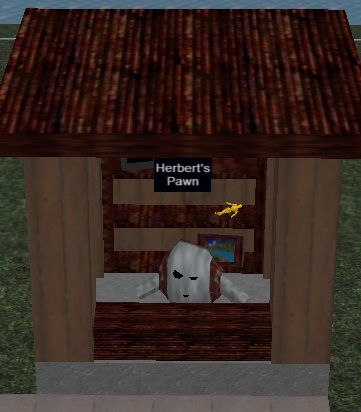 "Herbert's Pawn" began as a humble pawn shop near SW City's Town Square Park; now it is available anywhere you build! This pawn shop buys and sells a variety of common items, some of which you may have come across in travels outside of SW City. Clicking the Nimbusian activates an SW City Interactive shop. You must have a (free) SW City Interactive account to use the shop. Place the base object where the booth's center is. The base will be raised 13 shift-click's above the plane where you locate the object -- adjust as necessary.